I visited Ireland with my wife. Among sightseeing we visited two legal stations: Midlands 103 in Tullamore (103.5 MHz; main office, www). Nice tour given by PC William Faulkner on Thursday!! They really have content and talk on Irish local radio. William played only one music title in his show 9.30 - 12.00! I have heard this station many times at my home on FM and William wrote me verification of my receptions on 103.5 and 102.1 (Athlone-local). Also a short visit to Galway Bay FM, Galway, in westcoast of Ireland (95.8 MHz, www) on Friday. Everybody was buzy at the station because of outside auction-broadcast from city centre. On Saturday evening I was also lucky to visit AM-pirate Energy Power AM, Dublin! These guys really have transmitters and knowledge! Many FM-transmitters was all around. Big surprise was ex-Century Radio 1143 kHz 1 kW-transmitter (Waiting to have good home!). In the outside cottage there were real classic tx: WKLR's 20 years old 400 W transmitter!! WKLR (West Cork Local Radio, www) used this mid 80's on 1503 kHz (200m). This crystal was still on it's place! Energy Power was on the air on MW on Saturday just because my visit. Nice surprise! 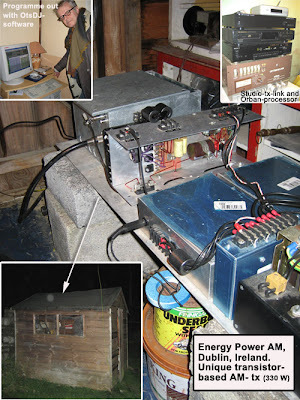 They use unique homemade transistor-AM-transmitter with 330 W. Nice signal even 20 km away! 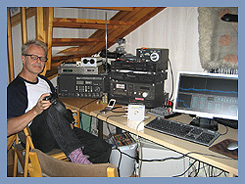 94.15 MHz - Rythm FM, Dublin. Weak. 24h weekend with dance. 94.65 MHz - Dance FM, Dublin. Strong with RDS. 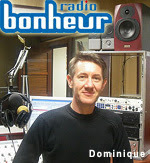 On air every day 24h. 99.5 MHz - Chance FM, Dublin. Weak. Oldies format from 60's to 80's. Weekend. 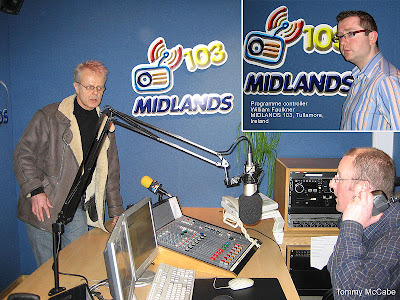 101.3 MHz - Club FM, Dublin. Fairly strong. Weekend dance station. Three of Dublin's four FM-pirate were dance-stations. 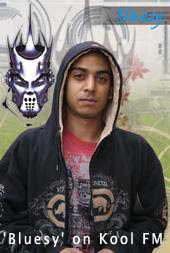 Dance FM had silent carrier since Saturday evening and went totally off air on Sunday evening! These signals were picked up in a hotel (2nd floor) near Dublin airport 10 km away from city centre with Sangean ATS-909 and normal whip. I will put some photos of my visits later!! 80's was the golden decade of pirate broadcasting in Ireland. I was also lucky to receive many Irish big and small pirates on Medium Wave and FM. I have a reply from 20-30 Irish pirates. Summer 1988 was good on FM-DXing. I heard many Irish FM-pirates here in Finland via Sporadic E-skip! Many years back I made an audio-mix of the ID's and jingles of these stations - and now I made a little movie, too. There is a slide-show with jingles and ID's. 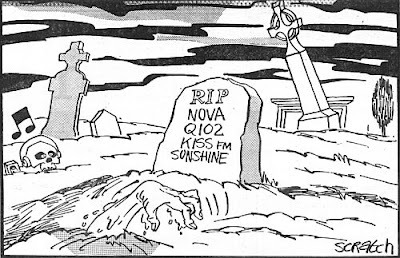 These are the stations in order of appearance: Treble TR, Capitol Radio, Super Q, CAU FM, KISS FM (Monaghan), BIG M, Liberty 104, ErneSide Radio, Radio West, Radio Vera, Radio Nova (Unfortunately I did not get good ID or jingle from Sunshine 101 and many others). You can see and hear this Irish-Mix-1988 as WMV (2,5 Mb) here. On Wednesday 22nd August we had FM-signals from Balkan countries (Serbia, Croatia) and also Hungary and Italy. Only little spots up with a few stations coming up at one time. Signals were mostly strong and clear. Nothing interesting heard although this kind of conditions can give some nice surprises. On Saturday evening there were weak signals coming from North Italy and Southern France. The most interesting catch was Corsica!!! It is very rare here! A few other networks were also audible. I will take e-mail contact to these French stations to have confirmation of my listening. On Friday 17.8.2007 there were good opening to Italy on FM but I was at work. On 16th of August I had unique contact from Croatia. Mr. Damir Totman from RadioComm Co (www) asked me if I have received the transmitters which they have installed. His company gives full installation and maintenance service for FM-radio stations. The transmitters he mentioned were Radio Trsat on 87.6 (20 kW), Narodni Radio on 101.9 MHz (20 kW) and Otvoreni Radio on 103.6 MHz (30 kW). I have not made any loggings of these transmitters although it is possible I have heard them. Narodni and Otvoreni I have heard on different frequencies first time almost 10 years ago. However, all these mentioned transmitters have been heard in Finland with good signals during last two years, in Helsinki and Tampere. During the whole day on Wednesday 8th of August was Italian FM-stations coming up and down. I was not able to listen because of being at work for preparing new morning show to our radio station, starting next week. I was reported that FM-stations from Rome were up for some time. 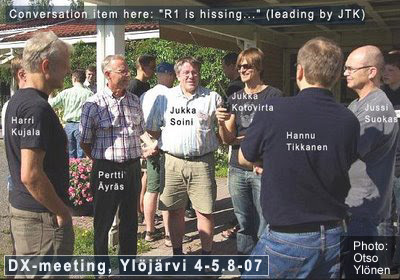 During the weekend 4-5th August 2007 I participated Finnish Annual DX-summer Meeting in Ylöjärvi near Tampere. There were around 100 visitors and nice programmes, presentations and DX-friends. The highlight for me was to win funny 3-level competition. One part of it was QSL-throwing (card)! Luckily I have now World Record on QSL-throwing with 12 meters 46 cm throw!! On Saturday 23rd June 2007 I heard Serbian FM-station on 91.1 MHz. I heard commercial spot of "Cafe-Pizzeria Fontana" in Despotovac-city and another spot to Kragujevac (mp3 of my reception). Radio Puls (www) operates on this frequency in Despotovac, Serbia. A few days after listening I found Radio Puls' webpage and I phoned to this station and tried to get audio-QSL-verification via phone. There were nobody talking English, but I think the lady understands what is going on and gives me confirmation. She says "Yes" to my clear question! I have phoned to a few Balkan FM-stations and gave them a surprise like this (smaller exotic stations)! Only a few of those people there talks English! Perhaps it is not fun for them, but for me it is. (Naturally I use Skype which gives only a few cents/minute costs). 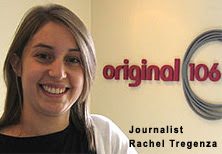 On the 15th of July 2007 I heard Radio Ten (www) from Begijnendijk, Belgium. It is a local FM-station which operates on 107.6 MHz with 100 W! 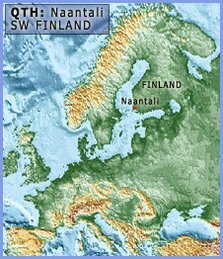 I e-mailed an MP3-clip to this station asking confirmation of this distant signal-skip to Finland!! On 26th of July I had a nice reply from this station and I got mp3-clip back! That was a studio recording from that very moment which I heard. Very nice surprise!! This was a little surprise to have sporadic E once again this week. Now we had strong signals from Turkey (Istanbul), Romania and Bulgaria. For the end shortly French FM-stations. + some network ID's like Fresh FM (Bul), Darik (Bul), Kiss FM (Rom) etc. On Friday 20th July 2007 there were nice Es-condition to UK (London and SW England) and NW France (Bretagne). I heard many local stations from England up to 108 MHz. The most interesting part of this opening were several London pirate stations! This is rare! + many other UK-locals around 95-97 MHz and around102-103 MHz. On Monday evening 17.7.2007 there were good opening to Russia and Ukraina on FM! I heard strong signals from FM-stations from Moscow, Kiev and some other cities. also many other stations like Hit FM, Nashe R etc.